Lamar Odom, according to TMZ, is reportedly missing and allegedly addicted to heavy drugs. His agent disputes this. Jeff Schwartz, Odom's longtime agent, told ESPN.com: "Lamar is not missing. His wife knows exactly where he is." Without disclosing further specifics, Schwartz added: "Playing in the NBA is still very much a part of Lamar's plans." This website was initially averse to relaying TMZ’s report of Lamar Odom’s alleged heavy drug addiction, partially because TMZ was the source, but mainly because the NBA tests for such things throughout the season (especially for previous offenders like Odom, who has a positive test for marijuana on his NBA record). So for TMZ to report that Odom “has had a problem for 2 years,” seemed a bit off, as Odom would have had to stay clean throughout the 2011-12 and 2012-13 regular seasons before picking a habit up as soon as the offseason began. TMZ’s recent report, though, is a little too tough to ignore. Odom is separated from Khloe Kardashian, which doesn’t really concern us, but there is also a report that Lamar has been missing for three days as of Sunday, with no news coming in the hours since about his whereabouts. Sources connected to the NBA star tell us people on Lamar's side, and on the Kardashian side have not been able to find Lamar or contact him for nearly 72 hours -- and we're told the main concern is he's hiding out while doing crack cocaine. As TMZ first reported ... Khloe Kardashian threw him out of the house Wednesday after attempting an intervention which Lamar squarely rejected. We've already told you Lamar's been battling addiction for at least 2 years -- and even reluctantly agreed to go to rehab in San Diego a year ago ... although he bailed after 3 weeks. Our sources tell us Lamar has gone off the hinges since basketball season ended and he became a free agent. It doesn’t take a source to notice just how terribly things have gone for Odom since the 2011 NBA lockout hit. Odom was back in New York City to attend the funeral of a cousin when his driver accidentally hit a 15-year old boy, who later died from the injuries. In less important but no less life-altering news, Odom was first dealt from the Los Angeles Lakers to the then-New Orleans Hornets and then to the Dallas Mavericks after the NBA objected to the initial trade. Odom had professed to wanting to finish his career as a Laker. Lamar, coming off of his best season as a pro, could have been a steadying influence for the defending champs in Dallas, but his all-around game disappeared and he played sluggish, indifferent basketball. After Mavs owner Mark Cuban called him out on this indifference, following a 50-game turn that saw Odom miss nearly 65 percent of his shots from the field, the Mavericks told him to go home with a month left in their season. 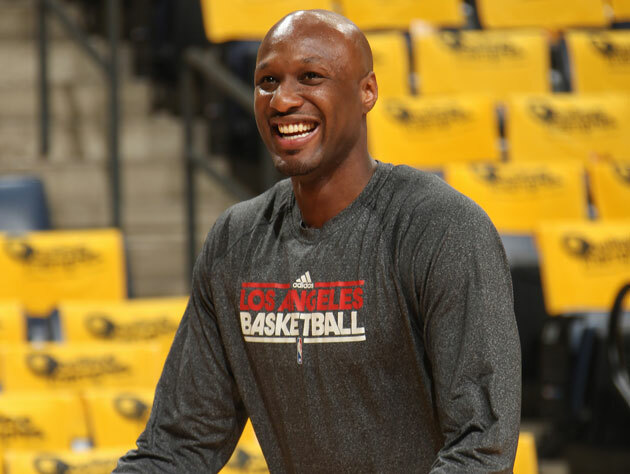 Odom would be traded to the Los Angeles Clippers for 2012-13, a seemingly perfect pairing for a guy that wanted to play in Los Angeles all along, with an up and coming team that initially drafted him 13 years before, but Odom once again struggled mightily at all aspects of his game in the final year of his contract. Though there was some apparent interest in re-signing Odom earlier in August, those rumors have since cooled as the Clippers look elsewhere. And now, according to TMZ, Odom is missing. Reportedly, according to the website, because he is chasing down his demons with the aid of narcotics. We’d really like it for this story to stop getting worse, and for this spiral to end. Get in touch, Lamar.